Every once in a while, a person comes along who seems to exist on a different, more fearless plane than the rest of us. Malala Yousafzai is one of those. Malala is remarkably self-possessed at the age of 16, but that makes sense when you consider that she's been giving interviews since she was 11 and participating in public speaking competitions even before that. 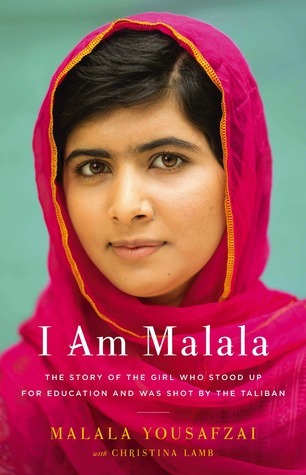 Speaking up and speaking out came naturally to her at an early age and that shows in I Am Malala. Her father, an educator, is obviously a huge influence in her life. He dreamed of opening a school and his determination to provide an education for all children, both boys and girls, regardless of their ability to pay, is admirable. He taught Malala that "there was nothing more important than knowledge" and "If you want to resolve a dispute or come out from conflict, the very first thing is to speak the truth...You must speak the truth. The truth will abolish fear." It's impossible to know exactly where Malala's words end and her co-author Christina Lamb's begin. They provide an outline of Pakistani history, and specifically of her home area, the Swat Valley. She chronicles the devolution of their way of life as the Taliban took over. "The Taliban became the enemy of fine arts, culture and our history...The Taliban destroyed everything old and brought nothing new...We felt like the Taliban saw us as little dolls to control, telling us what to do and how to dress. I thought if God wanted us to be like that He wouldn't have made us all different." They destroyed 400 schools, set a deadline for all girls' schools to close, attacked and murdered public figures they thought were "un-Islamic". As the Taliban's influence expanded, "every day seemed like the worst day; every moment was the worst. The bad news was everywhere; this person's place bombed, this school blown up, public whippings. The stories were endless and overwhelming." Despite threats and escalating violence from the Taliban, Malala was fearless. "In my heart was the belief that God would protect me. If I am speaking for my rights, for the rights of girls, I am not doing anything wrong. It's my duty to do so. God wants to see how we behave in such situations...If one man, Fazlullah, can destroy everything, why can't one girl change it? I wondered." She frequently points to the Quran for support of her views. "In the Holy Quran it is not written that men should go outside and women should work all day in the home." "The Quran says we should seek knowledge, study hard and learn the mysteries of our world." "There is a saying in the Quran, 'The falsehood has to go and the truth will prevail.'" She speaks of her love of God and her trust in Him, her confidence that she is following His plan for her. For all that Malala is fearless, noble, and wise beyond her years, she also comes across as a pretty normal teenage girl. She loves reading and mentions a wide range of reading material throughout the course of the book: Stephen Hawking's A Brief History of Time, physics textbook, and Twilight. Seriously, the vampires made it all the way to Pakistan. She's also a pretty typical big sister, fighting with her little brother and smugly noting that even after she was shot and recovering in Britain, "my brother Khushal was as annoying as always...I quickly realized I could treat [my brothers] how I liked and I wouldn't get told off." Malala mentioned something remarkable in her interview with Jon Stewart that she also said in her book. She even wants to reason with her enemies, those who literally want to kill her. No one is exempt from her drive to better the world. "We human beings don't realize how great God is," she says, "I know God stopped me from going to the grave. It feels like this life is a second life. People prayed to God to spare me, and I was spared for a reason--to use my life for helping people." And she is. Y'know, I admire Malala, but I don't think the Taliban can be reasoned with. They shot her in face. Methinks that the Predator that killed the leader of the group that shot her in the face did the world a huge service.